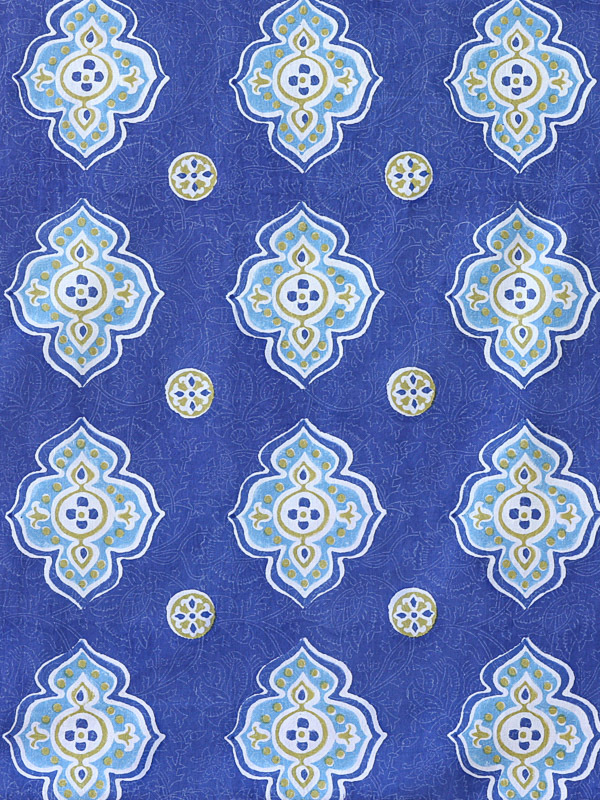 A Moroccan inspired print consisting of heavily stylized white, sky blue and avocado green quatrefoil motifs boldly pattered across a deep french blue ground. The first is white, since the very name Casablanca means "white house". White also represents the magnificently cloaked white tiled domes of the several hundred mosques that dot the cityscape, glistening and gently beckoning as the sun beats down on the white city. The shape of the highly stylized quatrefoil motifs are directly inspired by these stunning examples of Islamic architecture. The second is the color blue. Casablanca, a coastal city that sits at lands end, is eternally kissed by the blue waters of the Atlantic. That is the inspiration for the deep blue in the print; the use of the French Blue hue is a nod to the city&apos;s colonial past. The third color, sky blue, represents the color of the cloudless azure skies that drape the city which is blessed year round with a mild Mediterranean climate. Finally, the beautiful pale green color is an ode to the beloved beverage of the city that frequently pauses to enjoy steaming cups of hot mint tea.